2017 marks the 75th anniversary for the Royal Australian Air Force’s No. 2 Operational Conversion Unit, or 2OCU . The unit formed in April 1942 at Port Pirie, SA but relocated to RAAF Mildura, Victoria the following month. The unit provided training on all forms of aircraft during World War 2 but was disbanded in March 1947 after the war had finished. The unit reformed as No 2 OTU in March 1952 at RAAF Williamtown as the demand for more pilots for the Korean conflict increased and changed its name to No.2 (fighter) Operational Conversation Unit in September 1958. Since then the unit has taken RAAF’s newest fast jet pilots and turned them into fighter pilots. 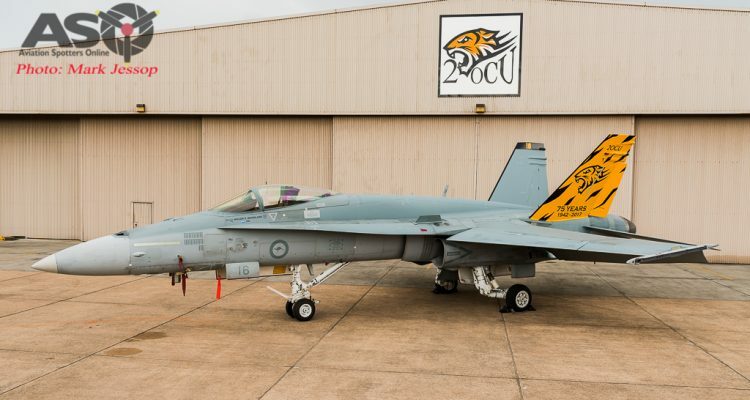 To commemorate the 75th anniversary, the unit decided to paint up one of their jets (A21-16) in a new scheme with the units “tiger” emblem on the tail. 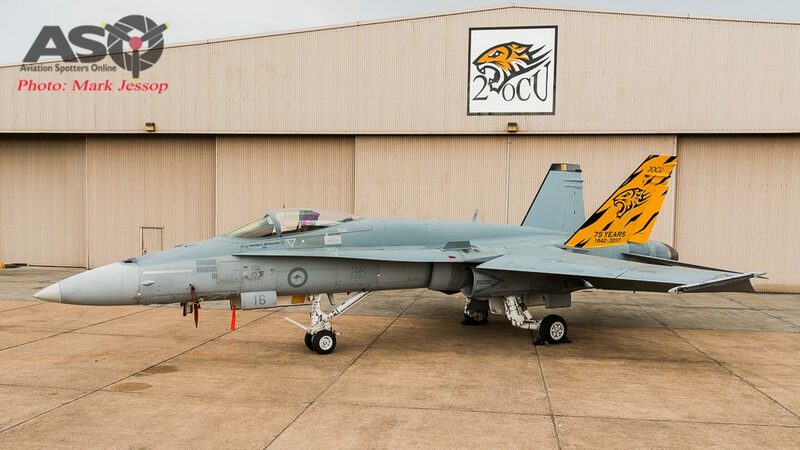 2OCU has another massive year ahead with air shows and the Fighter Combat Instructors course, or “FCI”, as well as training the next generation of fighter pilots; but ASO was privileged to spend some time with the new CO of the squadron as well as the new F/A-18A Hornet display pilot. 2OCU 75th anniversary roll out A21-16 and 2OCU CO WGCDR Scott “Woody” Woodland. Woody- Hi, Wing Commander Scott Woodland CO of 2OCU. I’ve wanted to be a fighter pilot for as long as I can remember, I have a family Air Force history of both my Grandfather and Father working in the Air Force so, as a little child being involved around Air Force bases and was very young say 4 or 5 years old when I saw my first Air Force jets and have had a passion for them ever since and have been fortunate enough to be able to pursue that passion, and here I am a number of years later as the CO of Number 2OCU. ASO- Do you remember the first military jet you ever saw? Woody- Yes I believe it would have been a F-111 because I was living in Brisbane and F-111’s were based up there. ASO- From that point you have the family history and you are focused on being a fighter pilot through your schooling, did you think that you could actually make it to that level ? Woody- I was always confident and just always worked hard to strive to achieve that, it was a sole focus. Maybe too singularly focused but I was fortunate enough for it to come to fruition for me. 2OCU 75th anniversary roll out A21-16. ASO- You applied for the military straight from school? Woody- I did but I was unsuccessful in my first attempt going through the academy, so I went to university for one year but decided I wanted to be flying instead so I went direct-entry a year later and was successfully accepted. ASO- So that determination was still there because that passion for aviation was so strong? Woody- Absolutely , I was a “spotter” from way back so I was determined I was going to do it one day. ASO- You’d made it into the Air Force but there is still a lot of steps and hurdles to becoming a fast jet pilot, can you explain that time? Woody- Yes, I was fortunate enough to be medically fit, have the aptitude and I just worked as hard as I could at school to achieve the grades there and once I got accepted into training I worked as hard as I could and always had my sights set on being a fast jet pilot. ASO- Do you remember the moment you found out that you would be a fast jet pilot? Woody- Yes I do, so at 2FTS in Perth we had our dining-in night when the actual postings came out. I was the only one on my course to be selected to go to fast jets so I still remember that evening vividly. ASO- How many people where on that course? Woody- We had a small course of only seven graduates, we started off with 16 and finished with seven of which five were Air Force and two were Navy. ASO- Did you want to fly the F-111 or at this stage or was your goal the F/A-18 Hornet? Woody- The Hornet was the new jet on the block and I wanted to fly the Hornet, so I was on number 5 conversion course for the Hornet only 2 years after we received it, so that was my aim. F-111 was my second preference because they were a fast jet but the Hornet was always my number one goal. ASO- It would have been Macchi’s in those days, can you describe the experience of going from a CT-4 to a Macchi and then onto the fastest jet, the F/A-18 Hornet ? Woody- Yes starting with the CT-4 at the beginning of pilot training to the Macchi was a big enough step as it is and while the Macchi was a jet with some speed under it, the difference between that and the Hornet was immense. It’s difficult to describe as it’s just a massive leap in capability of the airframe and the expectation of you as a pilot as well, so the Macchi prepared us reasonably well but it was still a very big leap to go into the Hornet from there. ASO- And a lot of new technologies compared to the Macchi to take in as well? Woody- Yes, that was probably the biggest challenges, the jet is very easy to fly like a Macchi was and is still very easy to fly but the systems management alongside all the flying is the key element you’re taught to manage as you are flying. ASO- So you have gone through the whole process and the next minute you are lining up on the runway to launch into your first flight in a Hornet, describe that moment. Woody- A little bit of disbelief when you realise you are in the jet on your own for the first time and you have been given the power to own, at that stage, a $40 million dollar aircraft strapped underneath you with 32,000 Lbs of thrust coming out the back. I remember the full-afterburner take off on that first one and climbing out on a clear blue-sky day out of Williamtown in a 45-50 degrees climb and just going “WOW” I can’t believe I’m here and they are trusting me to do this. ASO- What was the first squadron you were posted too ? Woody- 77SQN here at RAAF Base Williamtown. ASO- You have made the dream happen and have been posted to 77SQN , have you been posted to any other squadron’s ? Woody- No, I did one operational tour with 77Sqn and then was selected for Fighter Combat Instructor course (FCI), completed that and, after three and a half years at 77SQN, I instructed here at 2OCU for the next three years.Then I left for 13 years to come back to 76SQN,2OCU,77SQN,JSF Project and now back at 2OCU as the CO.
ASO- Can you describe going from an operational squadron like 77SQN to being selected for the FCI course , the level that needed to be attained to qualify as FCI Pilot ? Woody- So once I got into the Hornet community and found out what FCI’s where about, that was my next aim. Ultimately I obviously wanted to be a Hornet pilot and I succeeded at that and my next aim was the be the best Hornet pilot I could possibly be and that is the realm of the FCI. Each operational squadron generally only has one FCI, they are the mentor, trainer,teacher and the tactician responsible for that squadron’s success and development of all the junior pilots as well. That’s what I wanted to be and strove for that through out my operational tour. ASO- You have come to 2OCU as the next CO , what did you do before that ? Woody- I spent ten years in the Air Force and then I was out of the Air Force for thirteen years, I did some flying instruction overseas for a number of years and I also did some simulator instruction on the F/A-18 as a civilian contractor before rejoining the RAAF in 2008. ASO- What was it like to get back in the seat ? Woody- Everything I expected and more, so I came back with as big a smile on my face as I did the very first day I flew the Hornet. It is just a fantastic jet and the advancements that have come along in terms of software and equipment on the jet from the time I flew it, even though the jet flew the same and felt the same as I remembered it, most of the internals were different and the technology had been updated. It was just exciting to be a part of that again to pick up from where I left off and continue on was a very unique experience. ASO- So, even for an aircraft which is now in it’s thirty first year of service, it’s still an evolving capability where you still have to learn and maintain that level of being at the front as a fighter pilot ? Woody- Absolutely, it’s a non stop learning process and particularly now, back as an instructor at 2OCU, not only as the CO but with our current Air Warfare Instructor Course going on and the new generation FCI course. 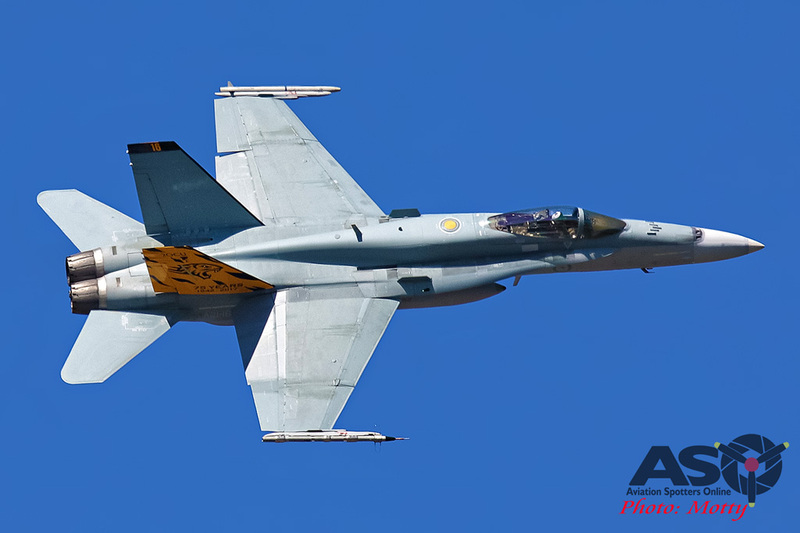 Tactics are continually developing, equipment is continually being updated , software is being updated and even though it’s an old airframe, we are continually building on its capabilities and it’s arguably the best “classic” Hornet fleet in the world. ASO- We have seen today the new painted tail on A21-16, can you give us a bit of a background on why it’s been painted? Woody- Yes, as many squadrons have recently gone through in our Air Force, it is the 75th anniversary of 2OCU having formed in Port Pirie SA and then moving to Mildura in 1942 as Number 2 Operation Training Unit or 2OTU. So basically No 2OTU evolving into 2OCU as the establishment responsible for training fighter pilots in our Air Force since 1942, it’s our 75th year which is quite a milestone to reach, so we have elected to celebrate that, especially with the Australian International Air Show at Avalon presenting itself as an opportunity and developing a new display pilot as well to showcase that to the public. 2OCU 75th anniversary roll out A21-16 with “tally” markings. ASO- We have a couple years left of the “classic” Hornet and you are going to be the CO of the squadron which trains the last “Classic” pilots, how do you feel about that ? Woody- A sad but exciting time. The “Classic” has served us very well over the years and to close it down at the end will be a sad moment I guess as any pilot saying goodbye to any type. With JSF around the corner and coming into service very soon, it’s very exciting as an instructor to be training the young fighter pilots of the future knowing that they will be both “Classic” pilots and JSF pilots in the future. ASO- Is there anything you would like to add to help a kid who wasn’t sure if aviation is a good career path or particularly Military or defense was a good career path with the opportunities or rewards you have had in your career ? Woody- I could not recommend the path I have followed highly enough, again I had a passion from an early age but many pilots I know weren’t of that same opinion. Some went all through high school not knowing what they wanted to do and even beyond high school before they decided to take the path, but I don’t know of one of them who has regretted doing that. It is more challenging for some than others no doubt as it is a lot of work to be done over many years but the rewards in terms of personal satisfaction you gain from becoming a fast jet pilot and being able to fly a jet like the Hornet or, in the future, the Super Hornet or JSF, and the opportunities you have in terms of the training you do , going on exercises around the world flying with other Air Forces, is just second to none. It’s an outstanding opportunity to develop, evolve and realise your full potential, and the training we offer in the Royal Australian Air Force, no matter what aircraft type you go onto, I think is as high a standard as anywhere else in the world. 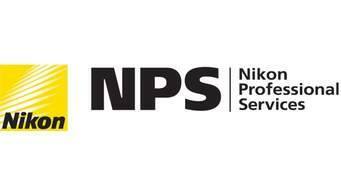 You are guaranteed a satisfying career and it’s what you make of it, so I would say don’t let doubts stand in your way, make sure you seek out the information, talk to people, get the right information and give it a go. There is no harm in trying, just what ever you do, don’t live to regret not trying. ASO- Is there one aircraft you wish you could have a go at flying? Woody- Yeah , a few of our pilots have been very lucky to fly the F-22 Raptor and I would have liked to fly the Raptor, but there aren’t many of them around. But I was also always an F-15C fan when I was younger before I joined the Air Force. We didn’t buy those but I always wanted to fly an F-15 and I would still like to do that if I had the opportunity. A21-16 in flight on a sortie out of Williamtown. If you are going to the Australian International Air Show at Avalon this week 2OCU will have a Special Lithograph made by Steven Evans from Ronin Graphics for sale as well as other merchandise. 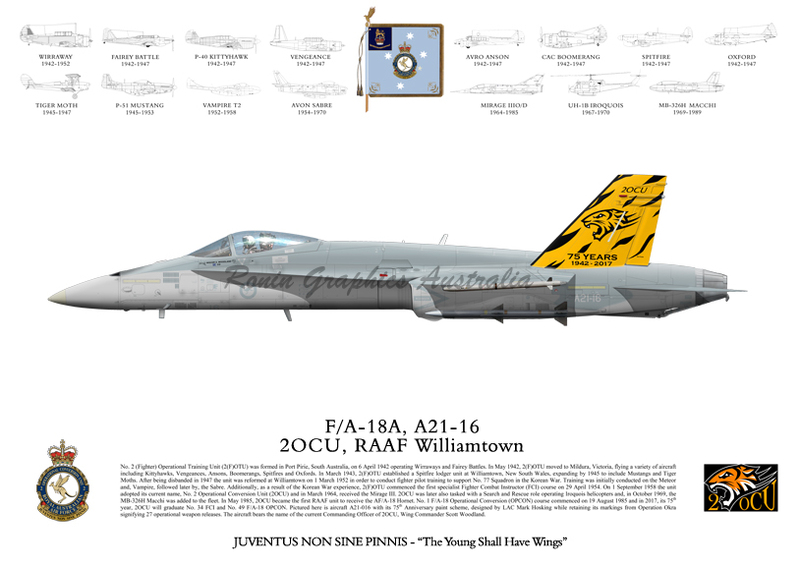 RAAF 2OCU Lithograph 2017 75th Anniversary Tail. ASO would like to thank the Royal Australian Air Force, 2OCU and WGCDR Scott “Woody” Woodland for the access and time.